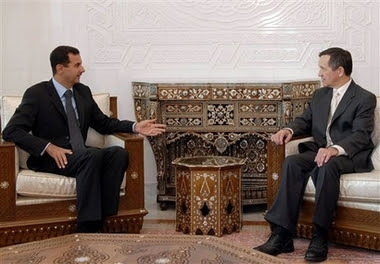 Rep. Dennis Kucinich (D-OH) and Syrian President Assad want peace! The two leaders agreed to stand for peace. In a meeting today with Dennis Kucinich, US Democratic Presidential candidate, Syrian President Bashar Assad said that Syria would be willing to participate in a multinational conference and peacekeeping force to help Iraq to manage its transition from occupied country to sovereign nation. Assad made these assurances and other observations in a two-hour meeting with Kucinich, who traveled to Syria to discuss a peace initiative which has arisen out of his anti-war work in the House of Representatives. President Assad agreed with Kucinich that various US demands for the privatization of Iraq’s oil and partition of Iraq would mean a continuation of war. You have to hand it to Kucinich. Where the other democratic candidates just talk about propping up evil regimes- He goes out and makes it happen! Update: J-Post is now carrying this news on the regime visit.